Updated 6. February 2018 because of capacity improvements in hardware shipped from this date onwards. This affects the LAPD capacity calculation. This post is an example of how to figure out how much hardware you need to monitor all the Abis signalling at a GSM site which uses STM-1 to transport E1 lines. The yellow lines at the top are the original 155Mbit/s STM-1 links going from the BSC to each BTS. There's one fiber for each direction. The green lines are the output of the fiber taps. They're an optical copy (typically taking 10% of the light) of the original STM-1. Each link has two taps, one for each direction. For this example, we'll assume that the application needs the signalling from both directions. The blue lines are fibers going from one SDH/SONET probe's sub-module to another. That lets us shift processing load from one sub-module to another. There are two models of the SDH/SONET probe. The lower one in the diagram is the low-end model: it has one sub-module. A sub-module has two SFP sockets and two ethernet ports. 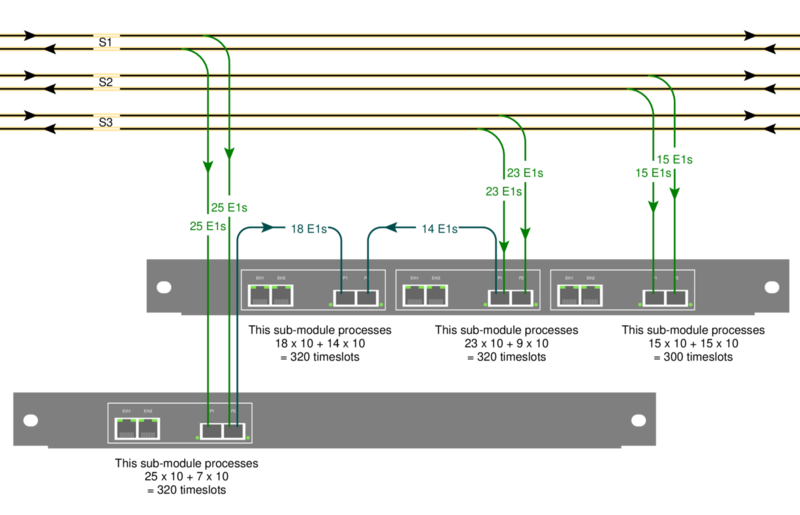 The SFP sockets accept SFP modules which connect to the optical lines (green). The upper one in the diagram is the full model: it has three sub-modules. For this example, I've assumed that we're interested in 10 timeslots of LAPD signalling on each E1. That's the worst-case in normal GSM installations. In practice, there can be fewer signalling timeslots, either because BTSs are daisy-chained or because the BTS doesn't have the maximum number of radio transceivers. Each submodule can decode 400 LAPD channels. Link S1 has 25 x 2 x 10 = 500 LAPD channels, so one submodule can't process them all. We handle that by running a fiber to the next sub-module. That way, 25 + 7 E1s are handled on the first submodule and the remaining 18 on the next sub-module. On 3G networks, the signalling is often carried as ATM, either directly on STM-1 (or OC-3) or inside E1 lines carried on STM-1. The principles for dimensioning are the same, but the numbers are different.